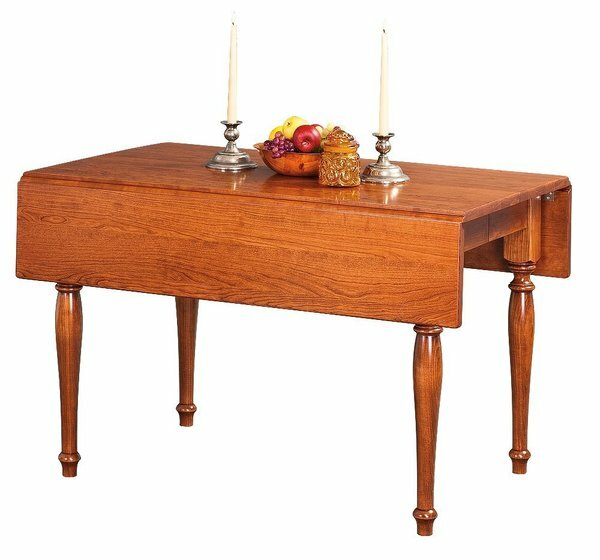 Our Square Hamel Dropleaf Extension Dining Table will look great in your apartment dining room or kitchen dining space. Flip the drop leaves up to make room for extra family or guests that happened to stop by. The table is shown with Amish Thumb Back Windsor Dining Chairs. Add these to your order to complete the look. We have just received our drop-leaf table and 2 extensions. They are beautifull, and the small size is just what we needed. Thanks for your great customer service and a beautifully made table. Hi, Ryan. I just wanted to take a moment to thank you so much for all you did to get our furniture shipped to us in time for our big party! Everything arrived last Friday and we are so pleased by the beautiful workmanship. Finally, we can seat large groups of people in our home! I am extremely thankful to you for how well you communicated with me throughout all the weeks I contacted you with questions. I really appreciate the care you took to help me, even rushing our shipment to us! Many blessings to you and all the staff and workers of JMX International.